Excursions into other worlds of other depths have been the source material and trademark of Capote's literary career. 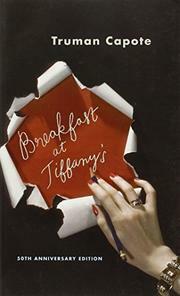 Breakfast at Tiffany's, a novelette and three short stories, is no exception and bears the indelible mark of Capote and an indication of his literary maturation. Holly Golightly, the heroine of the novelette, is the neurotic product of experience as child-bride, girl-about-New York, pay-as-you-play. Innocent services to a dear Mr. Sally Tomato result in her complicity in gangsterdom. She takes a quick trip to Rio and soon discovers rich and duhvine Senor, forgetting, thereby, the insults wafted by a rich Brazilian of indefinable vocation, a Hollywood VIP, and a lost cat. The short stories, notably "House of Flowers," are more reasonable. A girl from the mountains, who had turned prostitute, gives up all for love; an old prisoner revives his interest in life when Tico Feo, a soft-spoken Cuban boy, plays his diamond guitar; recollections of fruit-cake-making by a young child and his friend, an old woman. The vague undertones of homosexuality and the elements of weirdness are not as pronounced as in former books. These stories are gentle, delicate and almost sound.